puerto ayora , Santa Cruz Island, Galpagos. Pedestrians on the warm, asphalted roads of this island town walk casually, while cyclists give contemptuous glances to the few vehicles that ply. Sidewalk cafs ring out a mixture of pop, reggae and Latino music, and little shop-windows display T-shirts with conservation messages. Everyone greets everyone else in a pace that is unhurried and tension-free. Welcome to Galpagos, probably the world's best-known biodiversity zone. Hauntingly beautiful islands populated with Blue-footed Boobys which indignantly feel intruded upon if you walk past, magnificent Frigates, Flightless Cormorants and the Galpagos Penguin -- the only penguin-species to survive so close to the equator. There are 2,393 marine species, 531 of which are endemic; 560 plant species with endemicity in 180. Yet all is not smiles in this seeming paradise. The islands now face their biggest threat from 'introduced species', floral, fauna and homosapien. Galpagos became famous ever since Charles Darwin anchored for six weeks off the British naval ship H M S Beagle in 1835. He speculated on the variation of the archipelago's animals and went on to develop his Origin of Species theory. The challenge today is to maintain both local human community and biological diversity. In 1959, Puerto Ayora consisted of a small group of houses. Today its population is 9,000. 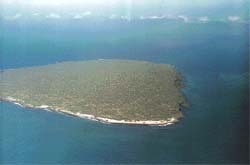 Though human habitation are allowed only on four main islands -- Isabela, Santa Cruz, Floreana and San Cristobal -- and a defence base at Baltra, the total population in the three per cent of area that is outside the Galpagos National Park ( gnp ), has risen from 5,545 in 1982 to an estimated 16,000 today. The rise is attributed to the government offering lucrative incentives for settlement, when Galpagos became Ecuador's twentieth province in 1973. These numbers have had a direct bearing on the growth of introduced species and the resultant problems. Early pirates and whalers in the 1800s accidentally introduced alien species, including goats and rats that are now the origins of trouble. Isabela, the largest island, currently has 125,000 wild goats and is facing severe erosion from overgrazing. Since the only indigenous herbivores are reptiles (giant tortoises and land-iguanas), overgrazing has affected their habitat critically. Says Alan Tye, head of plants and invertebrates at the Charles Darwin Research Station ( cdrs): "In the long run, the threat from invasive plants is probably greater than that from introduced animals, but at present the most severely threatened Galpagos plant species have been brought to the brink mainly through overgrazing by introduced herbivores and habitat degradation." Tye and his team at cdrs have inventoried 30 introduced plant-species -- brought in through migrations -- having invaded large areas. "Galpagos already has almost as many introduced plants as native species, while we cannot even keep track of the influx of invertebrates," says Robert Bensted-Smith, director, cdrs. The influx has also swelled floating tourist population from an estimated 17,000 in 1982 to over 64,000 in 1998, generating us $75 million in revenue. The management plan of gnp includes fixed itineraries based on carrying-capacity studies done for various islands, controls boats and tourist numbers on them and monitoring sites. The recent promulgation of new laws gives the gnp 40 per cent of the tourist entry fee of us $100 into the Galpagos (see box: A new law for Galpagos ). Still there are problems. Tourist quotas on boats were frozen in 1994, but boats have become larger by 'merging' the quotas of 2-3 boats through legal loopholes and political influence beyond the anticipation of gnp 's management-plan. In 1998, 'Galpagos Discovery', a tour-boat run by the company Kleintours, started operations using the passenger quotas of a motor-yacht Bucanero, that had folded in 1988. gnp argued this reuse as illegal, but Kleintours' lawyers said that the reversion of Bucanero's quota to gnp was illegal because it happened without administrative proceedings. The case involved a confusing wrangle among the ministries of tourism, environment and local institutions. Galpagos is indeed governed by a complex plethora of institutions. The principal ones are three Municipal Councils on Isabela, Santa Cruz and Floreana, a Provincial Council, Provincial Governor, various departments like health, education, fisheries and an administrative body called ingala ( Galpagos National Institute) which is responsible for overall monitoring. But problems have arisen not just due to confused authority from this network, but also from the bifurcation of gnp 's 97 per cent land area and the three per cent civil area. Eliecer Cruz complains of ingala 's weakness in controlling migrations into Galpagos and its resultant pressures on both land and sea. Though ingala 's latest measures include re-assessment of residency status, the last two years have seen a trial-and-error method of updating residency cards and inventorying arrivals at Galpagos' two airports, while there are still no regulations on entry by ships or via the Air Force Base at Baltra. The talk on the street is that it is even possible to 'buy' a residency-card. But the most visibly dramatic conflict with political overtones in Galpagos emerged in 1998 from the newly-constituted Galpagos Marine Reserve ( gmr ), encompassing 40 nautical miles (74.08 kilometres) around the archipelago, having the richest marine biodiversity. Prior to the area being protected, commercial fishing profited hugely from exports of tuna, lobster and until recently sea cucumber (see box: Fight for conservation ). The new law bans the harvesting of many species. Reports of court rulings opposing gnp orders continue to circulate. "This situation of awaiting legal outcomes is like a game of chess," says Robert Bensted-Smith. "It's not clear yet what the final outcome will be." The 1998 gmr 's draft management-plan, drawn up by cdrs and gnp in participation with local communities, allows non-industrial fishing, marine tourism, science, education, navigational and military manoeuvres inside, but has not specified the fishing techniques permissible, says The Galpagos Report , brought out by Fundacion Natura and the World Wide Fund for Nature ( wwf) . The result is a legal quagmire of seized boats, that gnp says were commercially and thereby fishing illegally. The boats were returned to owners instead of being auctioned off, a loophole the new law is yet to dispel. In 1997 for example, gnp officers withstood pressure from three cabinet ministers and detained a tuna boat ELI owned by Conservas Isabel S A, but had to release it on the direct orders of then President Fabian Alarcn (see box: fight for conservation ). The public opinion on gnp authorities' commitment is positive. Writer-photographer Tui De Roy, whose family moved to Galpagos decades ago, worries that gnp officers cannot take on hostile fisherfolk without adequate support. "Some years ago, a gnp patrol officer was fired upon and injured. Who will compensate them when they risk their lives without proper government support?" The islands' citizens also generally support conservation measures within the new law, but perceive them as functioning separately from their daily lives, suggesting a contradiction between conservation and social well-being, says a survey in Galpagos Report . Galpagueos' certainly enjoy a higher per capita average income than their counterparts on mainland Ecuador, evident from the money flashing in the discotheques and bars of Puerto Ayora's main street. But whether educational, health and vocational needs of this new generation of youth is being sufficiently addressed so that they do not compound today's problems in future, is a question that concerns conservationists, social administrators as well as the new law. And with mounting economic pressures on the natural environment from fishing, tourism and population-increase, clearly the law needs to be made to work.